HaNeshama Bekirbi is the much anticipated album of new superstar Motty Steinmetz, who first captured the world’s attention on the R’ Shlomo Yehuda Rechnitz’s Shir album. Motty Steinmetz’s voice is one of a kind, with an usual combination of sweetness, power, and intense emotion. His music feels largely like a throwback and has a traditional feel to it. There is no pop or techno or shtick (besides the shtick he can do with his voice, and what can’t he do?). 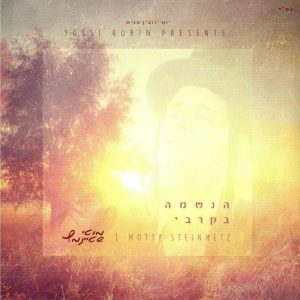 Motty Steinmetz does a particularity good job of conveying the message in each song through the tone in his voice because he sings with so much emotion. With a combination of Motty’s unique talent, some of the best composers in the business, and high level production, this is a quality album of authentic, old-school Jewish music that is sure to delight both purists and those looking for something “new”. A very powerful first song, Motty really shows off his voice right away. It almost sounds like a battle song, with intense percussion throughout. Motty sounds most in his element with the “lie-lie-lies” at the end of the song, which sound almost impromptu, and end with a cool falsetto note. A beautiful, gentle song in Hebrew and Yiddish, the chorus has an unusual memorable melody. The solo and harmony from Pinki Weber is a nice surprise. His deep, raspy voice provides a nice contrast to Motty’s. This may be my favorite slow song on the album out of many very good ones. This single was released a few months ago and so when the album came out, I’d already listened to it many times. Of all the songs, this one probably has teh most old-school Eastern European feel to it, and I love that about it. It’s medium tempo, relaxed, and upbeat. It was a great single to chose because in a way it sort of encapsulates Motty’s style, and I wish that more songs on the album were done more in this vein. The music is somewhere between blues and big band, and it all works very well together. While I can appreciate this song for being beautiful, I cannot understand it at all as it is a story in Yiddish. I do listen to it, and I enjoy it, and I even tried to get a friend to translate it. But no luck. It is gorgeous, and full of heart, but the meaning is unfortunately lost on me. Song number 6 and its only the second up-tempo song, one that is perfect for weddings. Of all the songs on the album, I probably listen to this one the most. I love the beat and I love the combination of Yiddish and English- both saying essentially the same thing: Hashem, I want to be close to you! (This much Yiddish I can easily handle!) It has a bit of a disco feel, and just overall had a positive fun feel that conveys the message of the words very well. A beautiful, stirring song, well suited to Motty’s voice, and with beautiful words from Tehillim. A fun easy to sing rendition of Lecha Dodi, aside from the music you would think you were hearing this in shul with an adult and boys choir singing along. I can definitely see this being sung in local shuls. It’s a relatively easy tune to learn and has such a light happy feel to it. Of course anything composed by Yossi Green is a gem. This song is 8:21 which is a bit long, but it couldn’t have feasibly been much shorter without changing the tune. Another gorgeous slow song, very calming, that is until your ears perk up at the crazy notes he hits in the end. I also love the harmonies in this song. This has a similar message to Va’ani, but with an extremely different feel. Of all the songs on the album, this one probably feels the most full of genuine emotion, and that’s saying a lot on this album. Ana Bekoach is another slow song where Motty Steinmetz begs Hashem to answer our teffilos. The third very up-tempo song, and I just love it! The beat, of course combined with Steinmetz’s voice and his reliance on primarily traditional instruments, gives the song a real old-school feel, similar to Haneshama Bekirbi. I think this style is where he shines the most. One of my favorites on the album, and it ends on a neat note as well. Speaking of endings, we end the album with another slow song. As usual, it’s beautiful. The song makes very good use of the choir, and maybe it would have been neat to have a child soloist here as well. I hope to hear more from Shimshi Neiman in the future- everything I have heard from him has been very solid. Overall great album with nothing else out like it. Motty Steinmetz is in a category of his own. I predict a lot more to come from him!